Hey everyone. 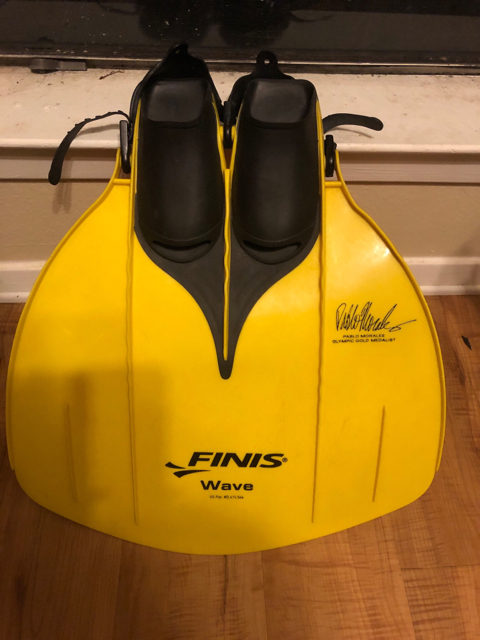 I’m looking to sell or trade my finis wave. $50 OBO. It’s in good shape, I’m a size 8 so the foot pockets are just a touch too narrow for me. If you are in DFW we can meet up to avoid ship. For trades I’m looking for an adult Linden fin. Last edited by A_Koi_Mermaid; 03-14-2019 at 11:20 AM. Our Etsy! - My Mermaid Pinterest Board! I was thinking somewhere around $50. It’s negotiable. But YAY you’re in DFW! You can come test it out with the pod this coming weekend if ya like. See if it’s a good fin for you. Yeah. We can also meetup sooner if ya want. I’d love to help you learn! The wave was my first fin and it’s what I learned in. We’ve been going to a pool in Grand Prairie but if that’s too far for you lemme know and I’ll figure something out. Lol It’s cool! Yeah it’s 15 minutes away for me too. Hmm, I know a thrift shop that has some cheap scuba flippers in the mean time if you can’t find anything and even if you can’t, still come! No fin required! I’ll do some digging too. A lot of the mers in our pod are about the same size and they use the Mahina fin. Neat! Thank you so much! If I see anyone looking to trade or buy fins of the right size I'll be sure to redirect them here! Might just invest in a Linden Monofin. They're really reasonable and I've heard good things. I hope you do get that one, cuz I’ve heard good things too and I wanna know if it’s good. Updated price and trade info. Make an offer.